The 1920s was a thrilling decade for aviation. Daredevils were just beginning to hop across the Atlantic, and at least one airline was even experimenting with in-flight entertainment. But if you wanted to tour the United States by air it was a pretty involved process. And this beautiful map from 1929 showed you how it was done. Rebecca Onion over at Slate Vault has dug up from the internet mines this absolutely stunning map showing the routes that Transcontinental Air Transport flew in the late 1920s. 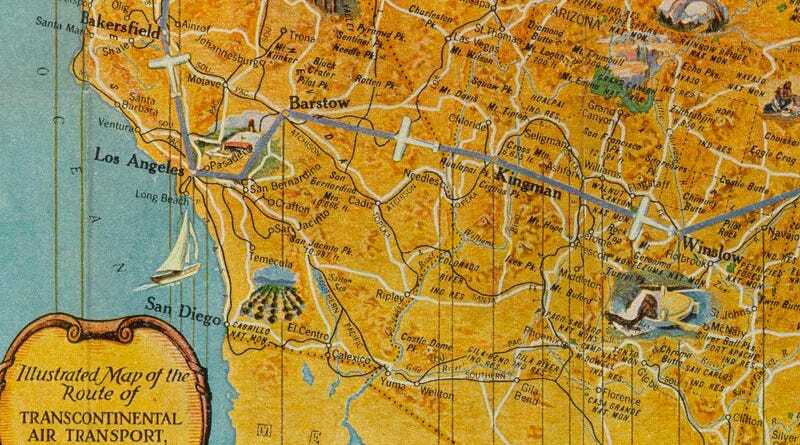 The 14 by 30 inch map was given to passengers who made the journey from New York to San Francisco, which involved a fair number of trains and automobile rides to complete. The map was digitized by the David Rumsey Map Collection and the site even has prints for sale. Clocking in at about 48 hours, the coast-to-coast journey sounds to me like it would've been absolute torture. But I suppose it's not that much worse than my last trip on AirTran, amirite? JK guys, we just like to have fun here at Gizmodo dot com with our jokes and our chucklegoofs.